Over summer, I want to travel around Europe on an International rail card and see some of the World that I haven't had a chance to see yet. This is also another opportunity to network and build long term distance clients, I feel that unless I meet someone in person they never usually grasp the sort of person I am. My plan is as follows. July 16th - August 16th : Spend a month working from The Netherlands down to Czech Republic looking for work. 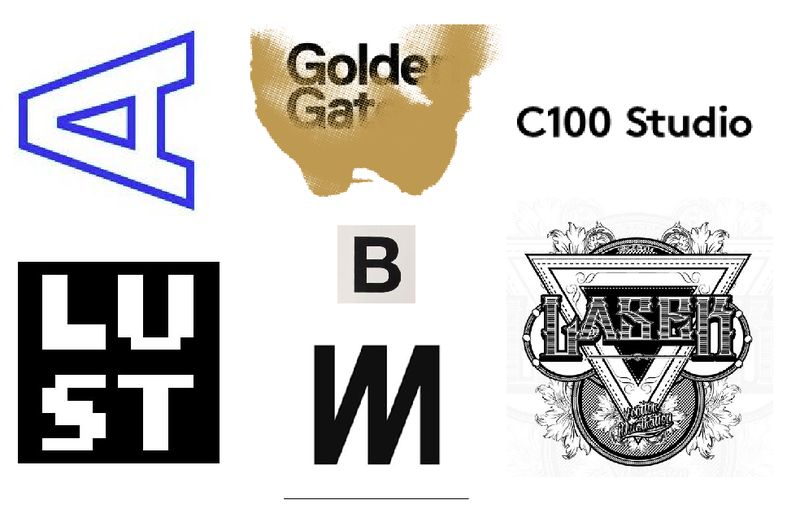 I've made a list below of the sorts of Studios I want to Visit. They work mainly with print, heavily with illustration but some are also type based. I think this is the sort of place I'd feel comfortable working, or popping in for a chat about how they work whilst travelling. Below is some of the research I've Been doing about interailing and the route I've been planning, as it goes a lot of people leaving University don't have the funds to go travelling so this is going to be a solo mission. Comparing prices between companies there isn't that much difference to travel for a whole month in terms of price, I think this is something I want to do as soon as I finish as the ticket price changes as you get older, on some of them 22 is the cut off point for an adult. I found the Article Below which I've also found really really helpful. It outlines all the things you need to consider when going travelling. Interrailing can be really up and down. You arrive tired, bagged-down with no map, no idea of where you are staying, no idea what you are doing, usually hungry and almost always dressed inappropriately for the weather (leaving rainy Austria at midnight and arriving sunny Italy midday!!!) After the first evening everything becomes much better. Similarly, some places are glorious and some aren’t. Interrailing can be quite a mixed bag! When you’ve been up since 4am it is difficult not to be ratty by 9.30pm, so GO WITH SOMEONE YOU GET ALONG WITH!! The InterRail Pass is a rail ticket designed for EU residents (Eurail is the equivalent for non-EU residents). To be an EU resident, you must have lived in an EU country for 6 months or more. There are two types: the Global Pass or the One Country Pass. The Global Pass is valid in 30 countries: Austria, Belgium, Bosnia-Herzegovina, Bulgaria, Croatia, Czech Republic, Denmark, Finland, France, FYR Macedonia, Germany, Great Britain, Greece, Hungary, Italy, Luxembourg, Montenegro, The Netherlands, Norway, Poland, Portugal, Republic of Ireland, Romania, Serbia, Slovakia, Slovenia, Spain, Sweden, Switzerland, Turkey. However, it is not valid in your own country of residence. You can choose from 4 different types of Global Pass, which are valid for different durations. You can choose 22 days or 1 month of continous travel, or 5 days of travel within a 10-day period, or 10 days of travel within a 22-day period. Overnight trains, if taken after 7pm, only count for one day of travel [the day of arrival]. 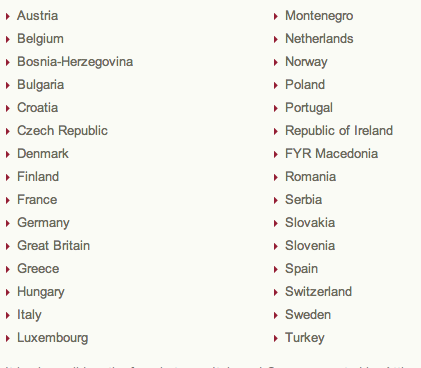 The One Country Pass is valid in only one European country. You can choose from any of the countries above but be aware that Belgium, Luxembourg and the Netherlands are combined to form the Benelux Pass. Also available is the Greece Plus Pass which incudes ferry crossings to/from Italy. The One Country Pass lasts for one month. You can choose from 3, 4, 6 or 8 days of travel. There are three categories of InterRail Pass [both for the Global Pass and the One Country Pass]: 1st Class Adult, 2nd Class Adult and 2nd Class Youth. Adult is defined as 26+, Youth is 12-25. Children between 4 and 11 years old pay half of the adult fare. Children under 4 travel free. You do not necessarily need to buy an expensive interrail ticket. If you are travelling in eastern Europe (Poland down to Croatia and anything to the East of that, basically the places that don't have the Euro) it is a lot cheaper to buy your tickets as you go. Going between countries varies from £3 to £20 maximum. It is also often cheaper to get a budget flight out to an eastern country to skip past the expensive France, Italy, Germany etc. Booking accommodation can be done just before or pre-planned. For those wanting to see lots of cities and countries with no set plan, booking the night before gives you incredible flexibility. However, if you have something really special in mind: book ahead. (We booked accommodation in Carcassonne for Bastille Day a few months in advance) It will give you peace of mind and also something to aim your journey towards. Write a list of places you would like to visit before you go, but be prepared to drop or cut short your plans as this list is usually far too ambitious! Most major stops are not more than 4 or 5 hours away so we found night trains to be a nice idea but totally impractical. You will just have to accept the half-days of travelling! ^^ The above depends on your route. It's almost impossible to spend less time travelling from Barcelona to Paris than you do on a night train. Same goes for Amsterdam to Zurich. If you book early enough in advance, night trains can also help you save on a hostel for a night - and you arrive at your next destination in the morning! Always check to see how far out the youth hostel is and make a note of any instructions of how to get there when you're booking. Also be aware that there are independent hostels that may be more suited to your needs [eg no curfew, no lock out during the day], and don't require YHA membership. Good websites to check are http://www.hostelworld.com andhttp://www.europeanhostels.com Both sites either have online booking forms for the hostels or contact details. Reviews of the hostels can also be found. The Thomas Cook European Train Timetable (£10-odd from Thomas Cook shops or http://www.thomascookpublishing.com) was a real lifesaver for organising our journeys in advance and also for spur-of-the-moment plan changes. Photocopy, or record the details of each of these documents and put into an envelope. On the front of the envelope write down any emergency telephone numbers and reference numbers (such as your passport number) for quick reference and to cut down on the bulk of items you need to take with you. I kept this envelope in a separate but secure part of my rucksack from the actual documents. If you are travelling with someone else I suggest you take a copy of each others' documents so if your backpack goes "missing" you have your details with someone else. It is also a good idea to email yourself scanned copies of the above documents just in case EVERYTHING goes pear-shaped, you know your details are sat in an email account waiting for you to access. Keep your interrail ticket and passport in an inside pocket, but not one too awkward to get to seeing as you will need to get them out regularly. I found the inside pocket of the head part of my rucksack the best. Take a combination lock chain with you. Most youth hostels provide lockers but not all - you can push it through the handles of cupboard doors or lock your rucksack to the foot of the bed. DOn't take a padlock with a key because they are very awkward. Just because your purse/wallet touches your body though, and may even be in zipped pockets, don't just assume you will feel it should someone try to take it. So please PLEASE split up your money, credit cards, ID, and tickets twice, even three ways BEFORE you leave home. My advice is to put some into your wallet, get a money belt (there are ones that look like normal belts, but have small hidden zipped compartments for folded bank notes into) to hide the majority of your money, keep a credit card hidden in your backpack (this way, should the worst happen, you'll still be able to eat and get home), and perhaps a document waist belt. Don't be silly and have everything in one wallet thinking you'll split it up when you get back to the hostel in the evening of the first day, only to find its too late and your left with nothing! But remember, wherever you are from, the most important thing you carry while abroad is your passport. Know exactly where this is at all times. Make a record of all document numbers, telephone numbers, and serial codes in advance (passport/credit card numbers, lost/stolen card hotlines etc, camera serial number etc). It makes cancelling things and getting replacements much quicker and easier - the first thing anyone who gets your wallet is going to try and do, is to get as much cash out as they can, so the quicker they get cancelled the better. Email a copy to your parents so they don't lose it. Also, this way if you lose something, all you need to do is call home and get your parents to call round for you. Oh, and backup all your friends numbers from your mobile phone before you, its a pain trying to find them all again when half of them are at uni with no internet, trust me. No one wants to read much about the bad things that could happen, and everyone thinks there's no way its going to happen to them. 1) As the Hitchhikers guide to the galaxy says, DON'T PANIC. I did and it didn't help - then again I'd lost all my money, identity (except passport thank god) and mobile, on the first day, and on my own. 2) If you still have means to do so, call home and get someone to call round cancelling whatever's been stolen. 3) Find out where the nearest police station is (your hotel/hostel should be able to help). There should be somewhere open. 5) Call home immediately after leaving the police station using the collect call details obtained (it doesn't matter what time of day/night it is at home). you reported the cards stolen, either to them or to the local Police. 6) Insurance companies also like to be informed quickly, often within 24 hours, so make sure you do this as quickly as possible. When Interrailing, like with any sort of travelling, space is limited so you need to pack lightly. You Also need to be sure to pack all the essentials. Read the guide on What to Pack to make sure you leave nothing behind and don't get overloaded with excess baggage. For InterRailing, considering you're going to be walking, getting on and off trains etc, I wouldn't recommend a rucksack any bigger than 50 litres. For two weeks I managed on 40-45 litres, and what you use for two weeks can be simply washed and used for a month. My friends took 60-80 litres, fine if you're happy to carry it, but there was quite a bit of complaining about heavy/big bags etc. Also by taking a smaller bag you actively force yourself to take less of the unnecessary things. I also recommend taking a wallet with you, for unexpected train tickets and border costs, so you don't have to be fiddling through your backpack trying to find some spare cash. I always say to allow between £25 and £40 a day [depending on how lavish you are] for your accommodation, food, travel (trams, buses) and entrance fees to museums etc. Remember to factor in the cost of your ticket, backpack and other equipment ON TOP of this. Overall, don't spend all of your money on the first day, and bear in mind that a little goes a long way. There are some unecessary items you can cut down on like unusual sovenirs, but my advice is to ALWAYS KEEP A BUDGET! Don't go over, otherwise you soon find out the consquences. You can get an estimate for the cost of your trip at http://www.interrail.net/english/overall_costs.php. · HostelWorld - The place to go to book hostels. Seems to have them all on and makes it easy. My identity As a designer..